Key Revolution believe that their latest product – the Mobiu portable office – can offer security for people who use multiple machines, with secure online storage and a USB with a SIM card. 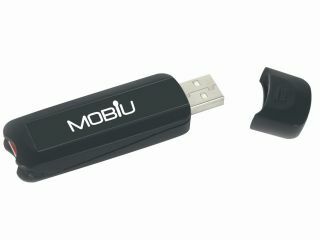 The Mobiu portable office – which should be available to consumers in September, is a plug and play device with a SIMAssured chip and PIN – ensuring that if you lose the stick you can ring Key Revolution to wipe the data and send a free replacement. Files can be stored on the MobiVault server hosted by NTT Europe Online and the MobiRoom private workshop allows you to share information with colleagues and friends. "Mobiu represents a breakthrough in portable computing for small and medium businesses, remote workers and consumers alike, said Adrian Burholt, CEO of The Key Revolution. "Users can now truly experience mobility without having to be concerned about security or leaving important information on the remote or borrowed PC." Mobiu portable office will cost £135 plus that pesky VAT for a year's subscription and the device.